There is now little doubt that a scam has been perpetrated with no remorse on Sri Lanka as a whole, by those who were meant to protect its financial integrity. The scam was pulled not once, but twice, within a few months. Incredibly, the second one took place after a Parliamentary committee had established that an unprecedented fraud had taken place and several irregularities that enabled it were identified. From the many reports in the media, the massive swindle has resulted in a loss to the Government of Sri Lanka (read the collective wealth of its citizens) of at least Rs. 11 billion, just for a start. And all this took place in the most sacred precincts of the Central Bank, allegedly at the hands of its guardians. Thanks to some diligent media interest, on most evenings one got details of how the scam was carried out, as investigations revealed an astounding lack of ethical restraint and shocking disregard for the ordinary citizens who would eventually pay for what was essentially a colossal bank heist. The outrage of the presenters of the evening news as the Presidential Commission report was released was palpable as they hosted a special segment dedicated to this misdemeanour. The consequences of the whole sorry affair fell on the heads of the innocent citizens, much like the stinking garbage mountain of Meethotamulla, burying them under increased interest rates, the falling value of the rupee, increased cost of staples, more Government loans, and a loss of faith in the Parliamentarians who could not credibly explain their own shameful involvement in it. In a brilliant deconstruction just weeks after the first scam was carried out on 27 February 2015, an analysis of the fraud was posted on Groundviews by Prof. Sam Samarasinghe and Dushyantha Mendis. Their analysis is clear enough for an amateur to understand the irregularities. Through the various in-depth analyses on TV and in the newspapers, it has become clear to regular citizens that the country and its people have been robbed by sophisticated financial manoeuvres thought to be beyond discovery due to their complexity. It has come to light only due to the courage and integrity of a few officials, a relentless media, concerned citizens, and some Parliamentarians. The story started with the Central Bank, presumably after due consideration of its experienced officials, offering the figure of one billion in bonds, the lowest offered in the last six auctions. The story ends with The Central Bank accepting 10 times its own original offer, at high interest rates, for a 30-year period, to the unprecedented and vast benefit of some of the dealers and a proportionate and enormously excessive cost to the country. According to the Presidential Commission, crimes have been committed and it recommends criminal proceedings against several of the actors involved including the Finance Minister at the time. That the President chose to address the nation on the day the report of the Presidential Commission was handed over, shows that this was a scam of monstrous scale, in a country that has not been short of them. It is an indelible slur on the slogan on which this Government was elected to power. It discredits the very notion of ‘Yahapalanaya’ or ‘good governance’ which will forever be associated with ‘Bondscam’ in the minds of the people. It is incomprehensible how some officials could go along with suggestions that were so enormously detrimental to the welfare of the people on a scale and in a manner that had never been attempted even in South Asia where corruption is endemic. How could they do this to their own country and its people? This brings us to the observation that the Governor of the Central Bank was not a citizen of this country, and couldn’t be expected to restrain himself on account of patriotism. This makes those involved at all levels who are in fact citizens, a callous group who would use their expertise and their privileged positions to wittingly burden their country and citizenry with long-term financial difficulties instead of relieving those burdens. How is it even possible not to consider the consequences to the people already struggling to survive, who are now burdened much more? How is it that reducing the people’s burden was not an overriding consideration not only for politicians who thrive on their support but for the officials who are in positions of power to do so? Obviously a country cannot rely on the integrity of its politicians nor that of its officials. That is why there are systems in place to prevent fraud. It is now clear that in the one place that should be double locked, doors and windows have been left open for theft. Since the risk is as high as has now been demonstrated, an urgent task has to be the implementation of the recommendations of the Presidential Commission to improve the system of controls at the Central Bank, ensuring its independence, and to introduce similar measures at the other Government institutions that have been implicated. 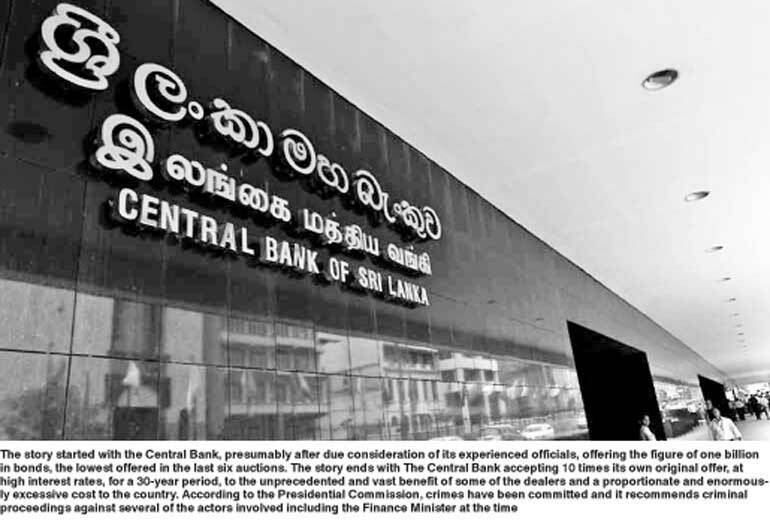 For a start, it might be prudent to legislate that the Central Bank’s top official should be a citizen or dual citizen (which is the same thing) of Sri Lanka. Perhaps it is providential that an election is at hand, and the people will have an opportunity to respond. There is something right with a country that ensured that such a scam could not be conducted completely in the dark. The retired senior officials who sounded the alarm, those courageous officials who refused to go along, the whistleblowers who risked very real danger to their lives, the decision of the President to appoint the Commission, the outstanding personnel of the Attorney General’s Department who were part of the Commission, a lively media with a social conscience, and some dogged politicians and concerned citizens, brought it out into the full glare of an incredulous but grateful public. The angry TV presenters of one of the media houses showed their outrage at the extent of the loss that resulted to the country by immediately recounting the unconscionable plight, 70 years after Independence, of school children studying under trees, villages without clean drinking water, desperate farmers without irrigation, and communities isolated for lack of roads that they had encountered during their programs, all of which could have been addressed with the money that was lost to the country. This is in addition to the direct losses to the EPF and Mahapola fund. Their anger is our hope. These educated professionals, mostly young, are refusing to countenance the contempt displayed by this and other such corrupt practices by a political elite without pity or mercy for the citizens who entrust to them the care of the country and their welfare by voting them into Parliament. The voters who are tempted to stay at home through disappointment, should make the effort to go out and have their say, for in those people who showed courage and integrity, there lies a glimmer of hope. This is a chance to show moral revulsion and administer citizens’ justice to those who tried a scam so monumental and morally offensive, and nearly got away with it.